Hello Project run and play readers! I am Shauna from Shwin&Shwin and I am thrilled to guest post today! I had the honor to participate in the last round of project run and play and it was so much fun! What a joy to return with out the stress Ha! 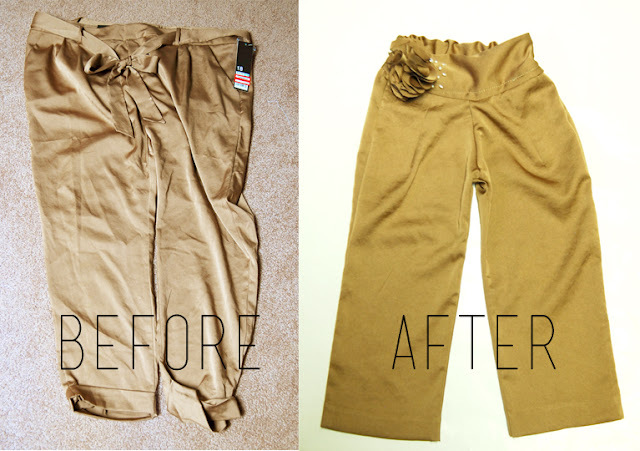 This week is all about refashioning and I love refashions! Fabric is fabric and often its a lot of fun to challenge yourself to make something out of something other than purchased yardage. The thing to remember about refashioning is you don't have to just refashion something old, and used. One of my favorite places to look is the clearance rack at stores. Sometimes you will hit the gold mine. For example, browsing the clearance rack at Target I found these Gold polyester pants in a size 18... yup the one thing everyone wishes they had right? Well I snagged them up for 3 dollars and knew they could be something pretty great. 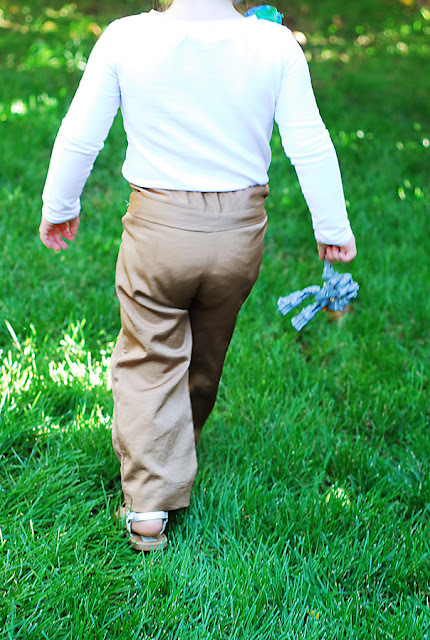 Soon they became some blossom pants for my little one. 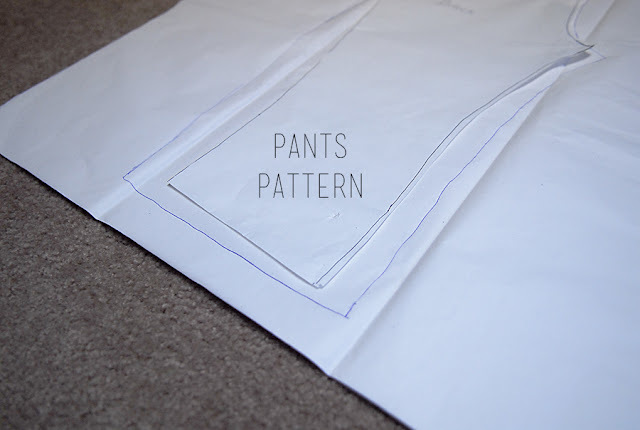 I started with my favorite pant pattern. (you can draft one too...directions here) I made the pieces wider, for two reasons. 1. I wanted a wider leg and 2. I wanted to add some darts to the front to add shape. So cut out the front and back pieces. 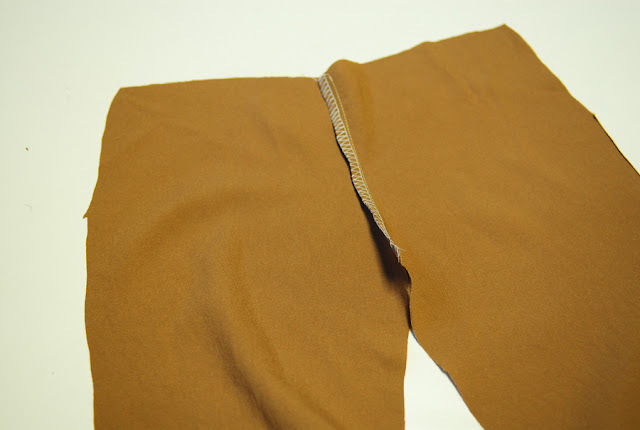 When refashioning pants I always use the original hem. Then start by sewing the front pieces right sides together at the front curve. Then I added two darts. 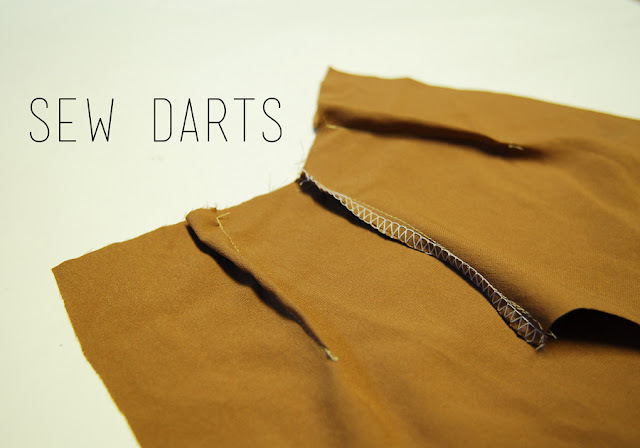 (need help with darts?) When I was making my darts I made sure that the width was half the waist measurement. Then I needed to make the waistband piece. The easiest way to do this is to make the band the width of the front piece (once they are sewn together) Then make it twice the height since it will fold in half. 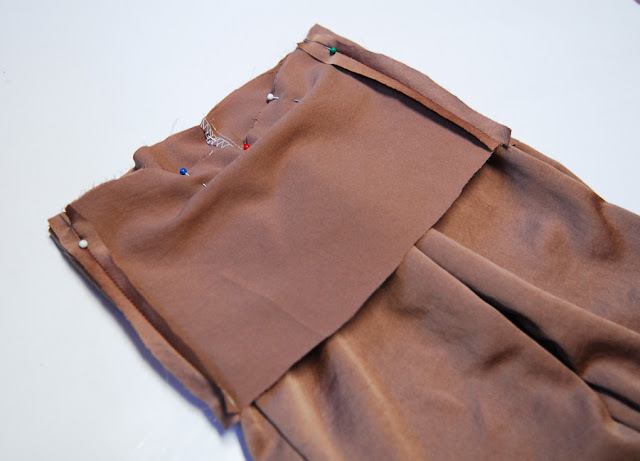 Then sew the back pieces the same you did the front, with right sides together at the curve. 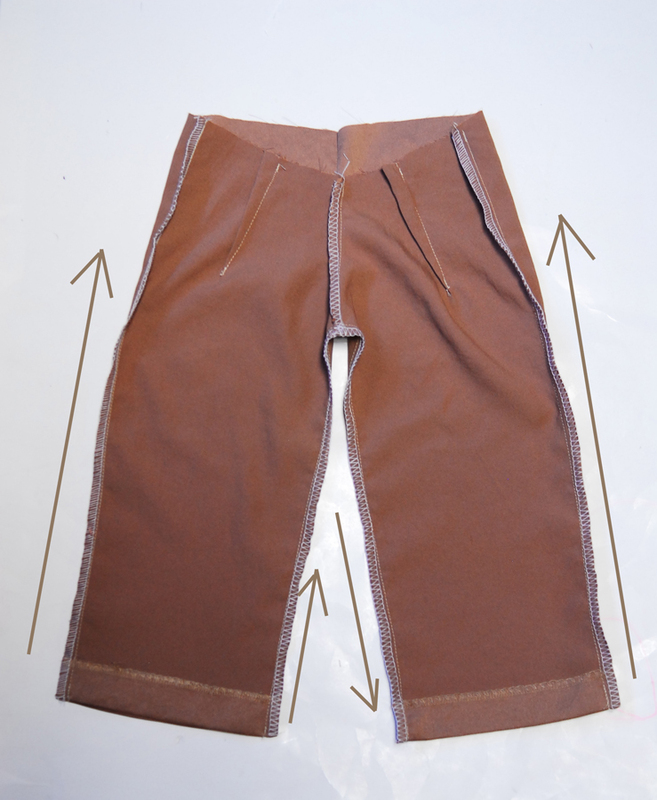 Then make a waistband piece the same way you did for the front. 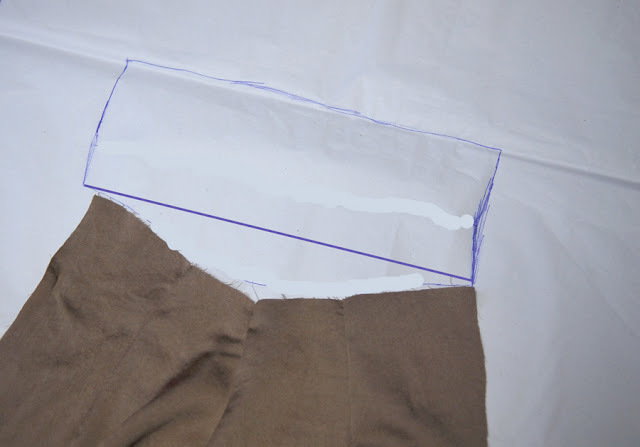 Next with right sides together you are going to sew up the sides for the legs and the inside seam of the legs. 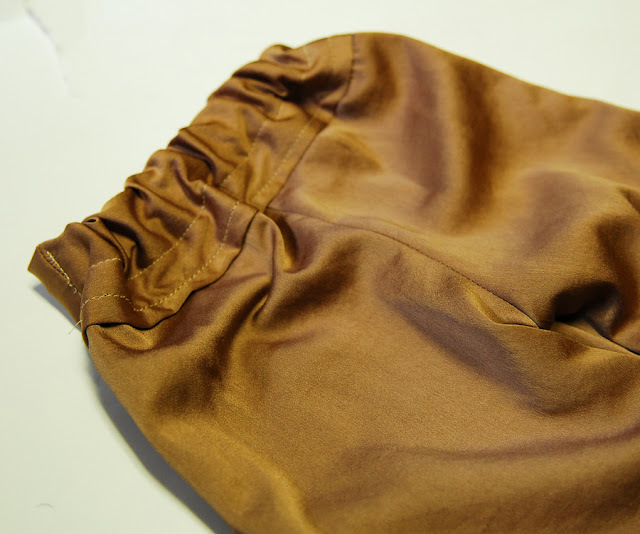 Then sew the waistband pieces right sides together at the side seams. Then sew the waistband to the top of the pants with the right sides together. 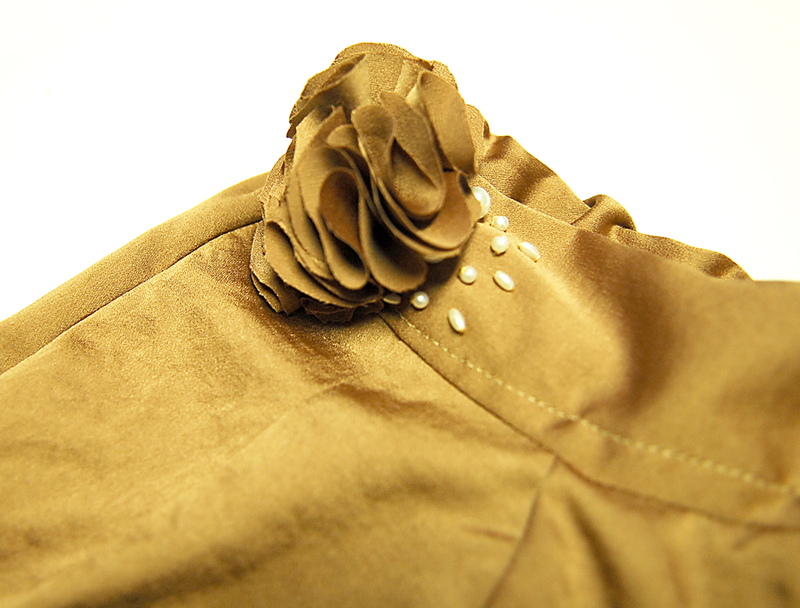 Match up the side seams, when you sew. 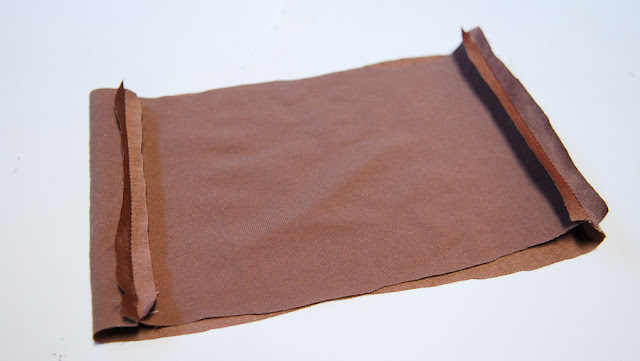 Then fold the waist band under and then fold it in half. 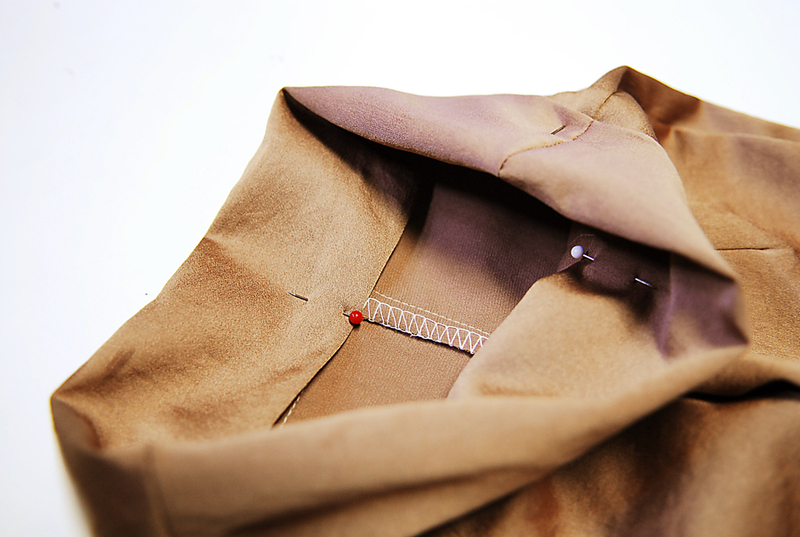 You will sew from side seam, across the back and to the other side seam. Then put elastic in the back in the casing you just made. Sew the elastic to secure at the side seams. 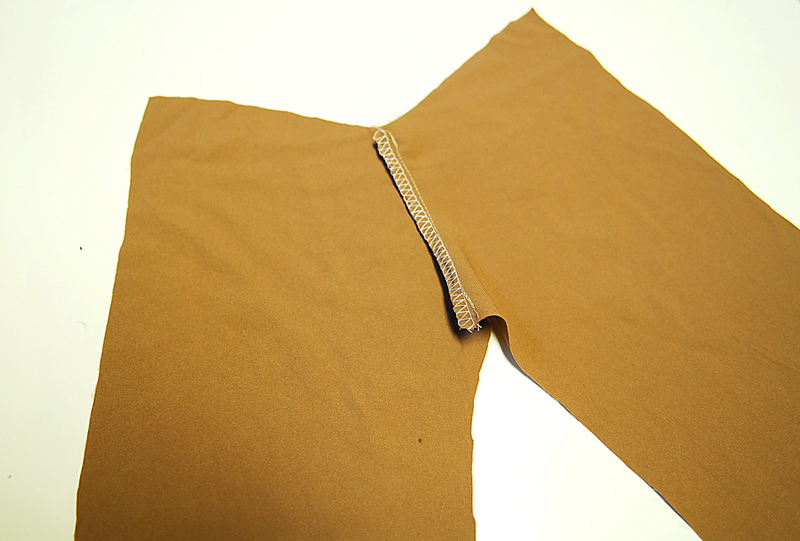 Next you can sew the waistband in place in the front. 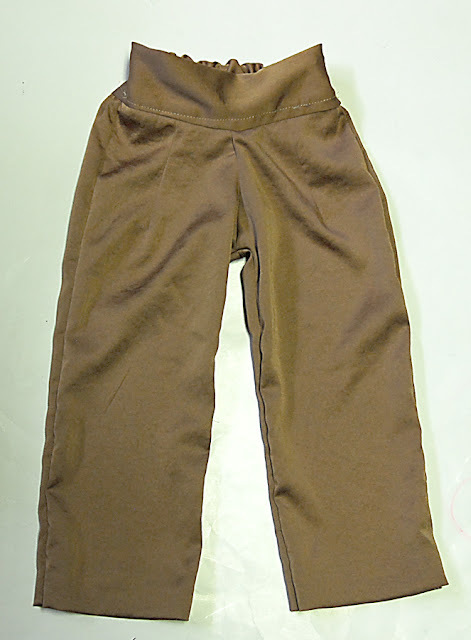 Now you have a very basic trouser. With elastic in the back. Then I cut out some circles from the left over material and made flowers like I did here and I added them to the waistline. I also added some beads. There you have it some blossom trousers. 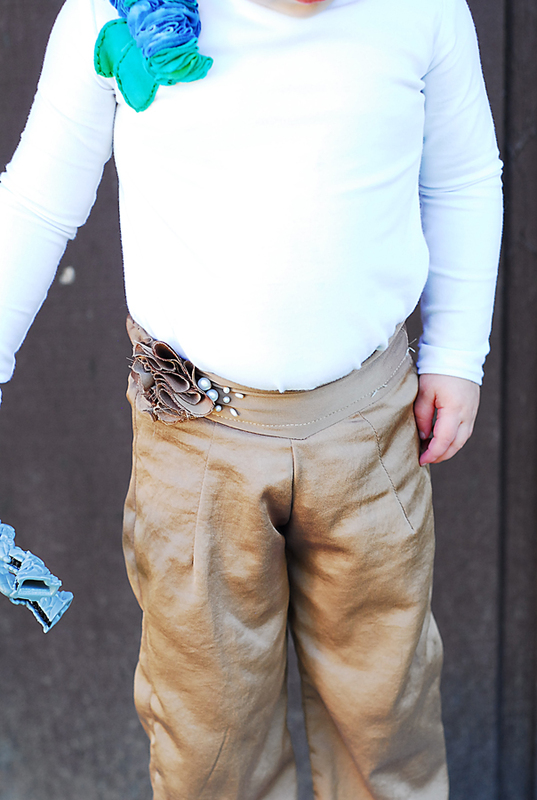 Perfect for a little something different for your little one. 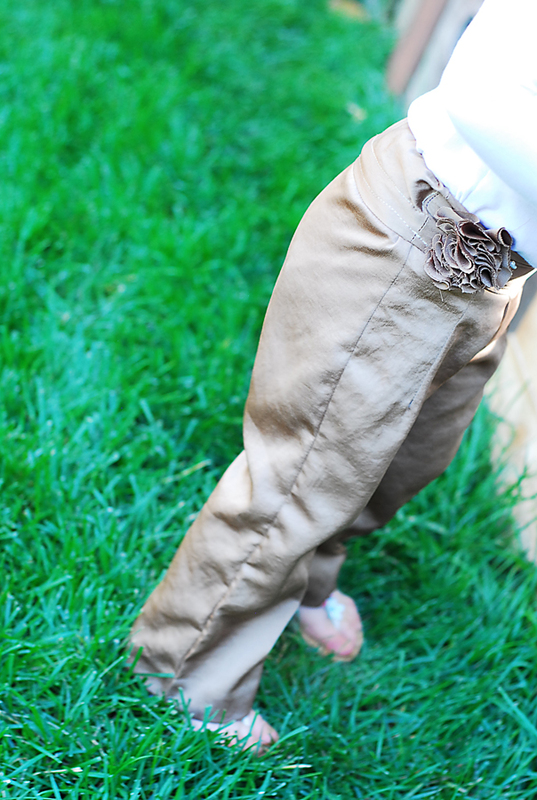 The blossom is the perfect little accent to pants waist. 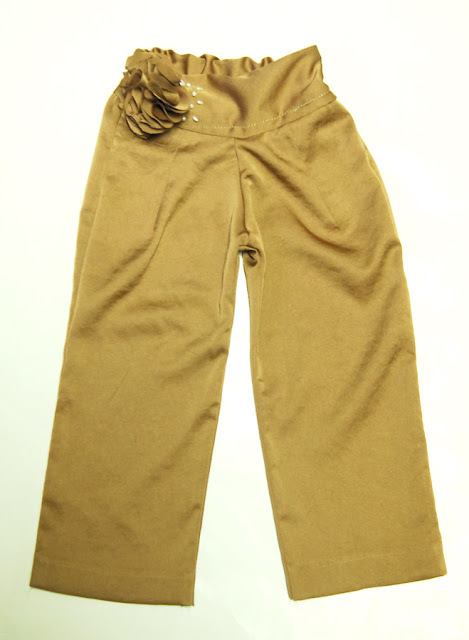 The perfect little trouser! Thanks for having us! You can stop by Shwin&Shwin anytime! it's astounding to me that you don't have a gazillion comments on this post! It is ALL OVER pinterest!! ;) WELL DONE...adorable! I love all of your toots...I've been going crazy making things from them. :-) one question....I love the accessories you add to things and am wondering how they do in the wash? Do you need to wash them special or anything?